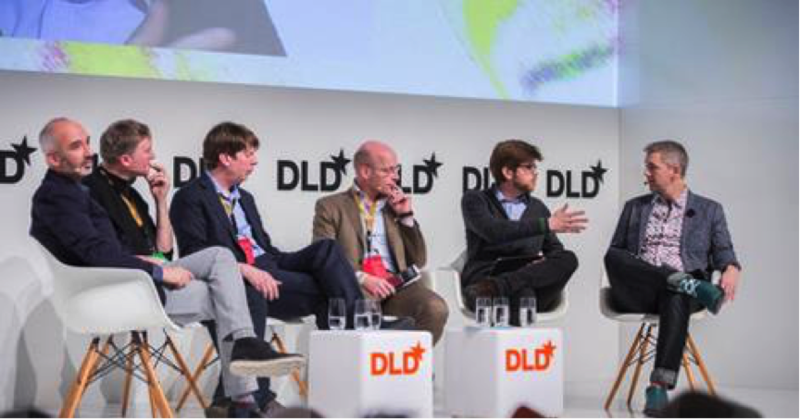 It was great to be back at the DLD (Digital-Life-Design) conference, held a couple of weeks ago in ever-stylish Munich – a kind European TED with talks debated by business, creative and social leaders and covering topics spanning innovation, digitization and connected culture. DLD has a certain something special about it – picture the scene of the opening speakers dinner in the grand elegance of the Kaisersaal, entertained by a rapping Ryan Leslie (Disruptive Multimedia) juxtaposed with an opera performance. Only in Munich. I joined VC Mattias Ljungman (Atomico), entrepreneur Brady Forrest (hardware incubator Highway1), designer Gadi Amit (New Deal Design), consultant Roman Friedrich (Strategy&) and entrepreneur / investor Lars Hinrichs on a panel themed “Connected Everything“. The discussion focused a great deal on data, and this being Germany, inevitably on the paradox of data as the value creator and data as the privacy invader in a world of smart things. It’s a fascinating collision. On the one hand, data is the life blood of dynamic, personalized digital experiences – our needs and wants understood by intelligent algorithms adapting product behavior to us. On the other the endless accumulation of ever more intimate personal behavior data presents real questions of accountability on those receiving it. Data is an intimate ingredient in making products smart. Bruce Sterling postulated the concept of a SPIME – an entity with functionality and behavior manifested at any moment in time through the dynamic combination of hardware, software and real-time data. A smart product is an intimate combination of these ingredients, with data informing its performance, functionality and personalization. In the 20th century we needed instruction manuals to understand how to use a product because the product lacked intelligence. In the 21st century we can expect the products we use to understand us sufficiently well to adapt their behavior us, to plug in and connect with the other products and applications we have around us. But to deliver this degree of personalization, programmability and intelligence a product needs to know a lot about us, about our context of use of it, and about the real-time situation in which it is being used. Product brands will compete increasingly on how well their products are able to do this, which means the value proposition of their products will depend on how much information we’re prepared to share. And there-in lies the rub – product brands have to earn our trust as consumers to be willing to share our data, and therefore to make their products competitive and valuable to us as consumers. Demonstrated accountability in personal data privacy and management becomes critical to competitive advantage. Coincidentally one of the case studies we discussed on the panel was BMW (a DLD sponsor) who have decided not to share any of the real-time data they collect from their vehicles with 3rd parties. This is a great example of striking a balance in the tensions and trade-offs of data management for the consumer. We want our vehicles to understand us, the environment and our travel needs. We don’t want the intimacy of our every movement blazing a digital trail for others to follow without our consent. BMW, a trusted brand, is tracing that line. Every product brand has to find this balance. Responsibility falls on the product manufacturer brand to demonstrate competence and reliability in managing and applying personal data in order to get that data from its customers and create powerful, personalized product experiences. The consumer is in charge. Read more of Niall’s thoughts in: Why Can’t I Google My Shoes?